Gardaí say they are aware of a female member of the Defence Forces who became radicalised and travelled to Syria but there has been no contact with her since. Lisa Smith from Dundalk in Co Louth served in the Defence Forces before travelling to the Middle East. The Department of Foreign Affairs has confirmed that an Irish citizen is being detained in Northern Syria but has not confirmed their identity. Gardaí, the Defence Forces and the Department of Foreign affairs have had no contact with the woman since she left Ireland a number of years ago to travel to Syria. She then transferred to the Air Corps where she worked for a time as an attendant on the government jet and served government ministers, former President Mary Mc Aleese and former Taoiseach Bertie Ahern. Mr Ahern said he remembered her and described her as a "lovely person". 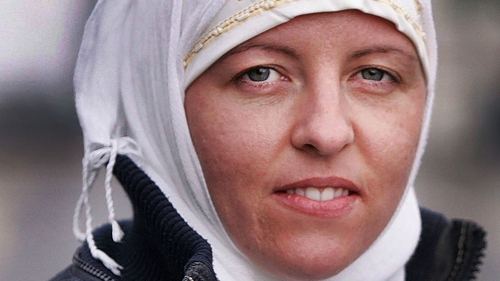 Gardaí say Ms Smith, who is in her late 30s, converted to Islam eight years ago while she was in the Defence Forces and it is understood she sought to wear a hijab while serving. Gardaí have been in contact with her family in Dundalk and while they are keeping them informed of developments they cannot say that she is being detained. Her family has declined to comment and have appealed for privacy. The chair of the Irish Muslim Peace and Integration Council, Shaykh Dr Umar al-Qadri, said important questions now need to be answered. Dr Al-Qadri said: "We need to find out where did she embrace Islam, which people was she in connection with and who radicalised her. I think it's important we find out about this, so we can avoid this in the future, and prevent anyone else from being radicalised." Speaking generally, Dr Al-Qadri said that radicalisation is a phenomenon that "doesn't necessarily take place face to face." He said that in most cases of extremists or those radicalised regarding ISIS, "we find they have radicalised online." An ITN video was also brought to the attention of the family which featured a woman in a hijab in Syria who said she was British but sometimes spoke with what sounded like an Irish accent. The Department of Foreign Affairs said this evening that the Government was aware of media speculation and reports of an Irish citizen being held in Syria. The Department said there has been no recent request for consular assistance from any Irish citizen inside Syria, which is an "active conflict zone". It said: "It is not feasible at present for Irish consular officials to enter such a conflict zone." Neither the Irish nor the British governments have any consular facilities in Syria. The US Department of Defence said in a statement it does not have any information regarding a possible Irish citizen in custody in Syria as they are still processing thousands of people from the Baghouz area. A spokesperson for the Minister for Justice said Charlie Flanagan is aware of the reports. However, the spokesperson said it would not be appropriate to comment on the detail of security matters, or indeed on individual cases. "The minister has stated that protecting the State and the people from terrorism and supporting international peace and security are amongst the highest priorities for the Government," the spokesperson added.